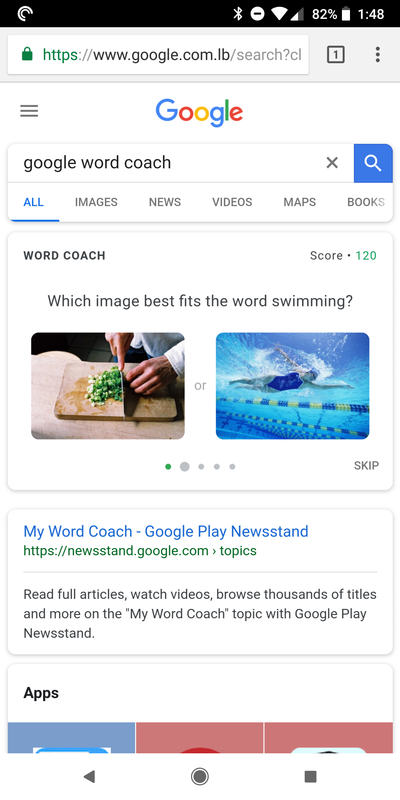 Google is always making improvements to its search, whether it's through knowledge cards or little Easter Eggs. 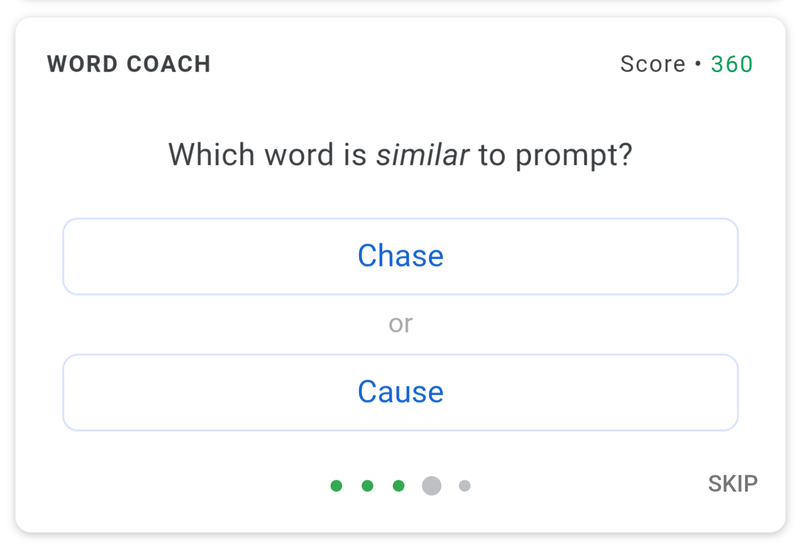 This new Word Coach addition can count a little bit as both: it's informative, but it's also designed like a game. Google already has a dictionary/thesaurus that shows up in search results when you search for "word meaning" or "define word," and it was recently updated with a search box and history. 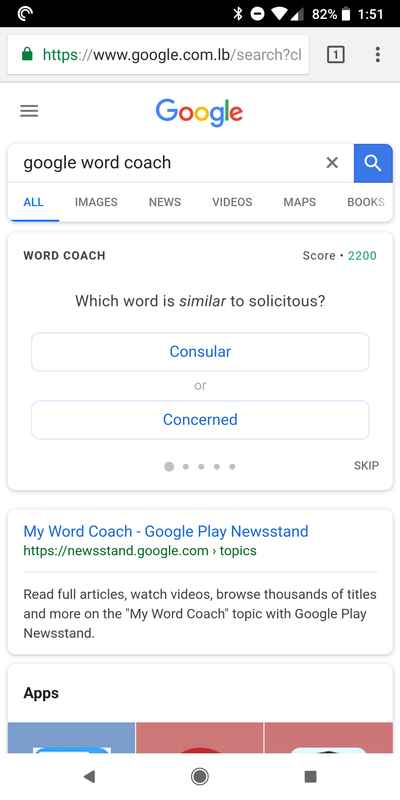 The Word Coach complements it and is starting to pop up below the dictionary card with a small 5-question test that first relates directly to the word you searched then spreads a little to other words. 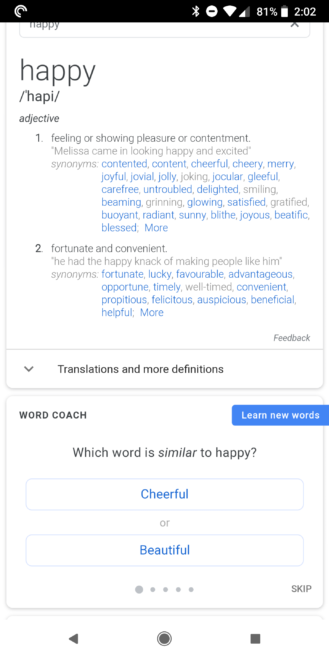 However, you can also invoke Word Coach directly in the Google app or Chrome on your phone, by searching for "Google word coach," or simply, "word coach." 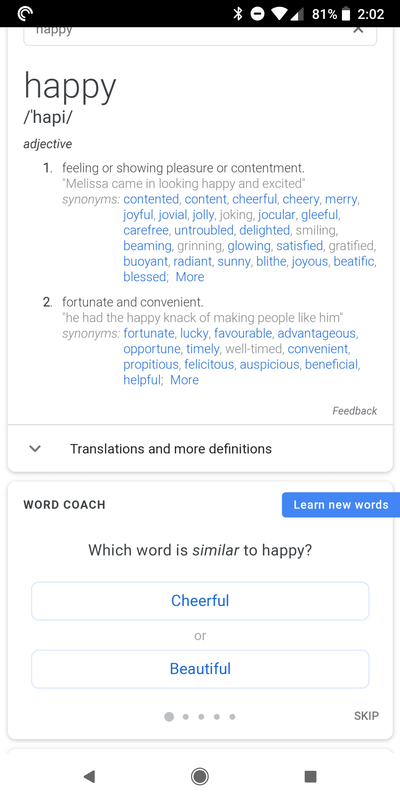 Some questions ask for synonyms, others antonyms, and some use images. There are always 2 choices to pick from and at the end of the 5 questions, you get a little score card with explanations for each of the answers. There's also a "Next round" button to continue with another test. 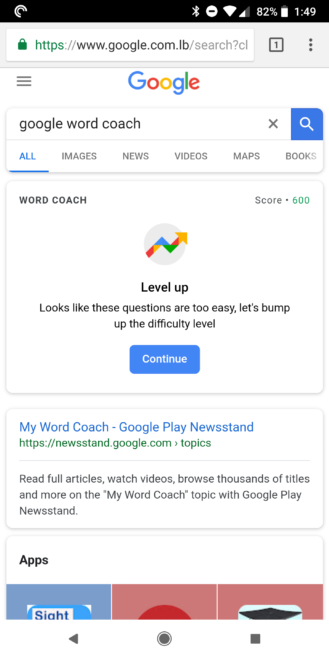 If you answer a couple of rounds without making any mistakes, you might get a card to level up. 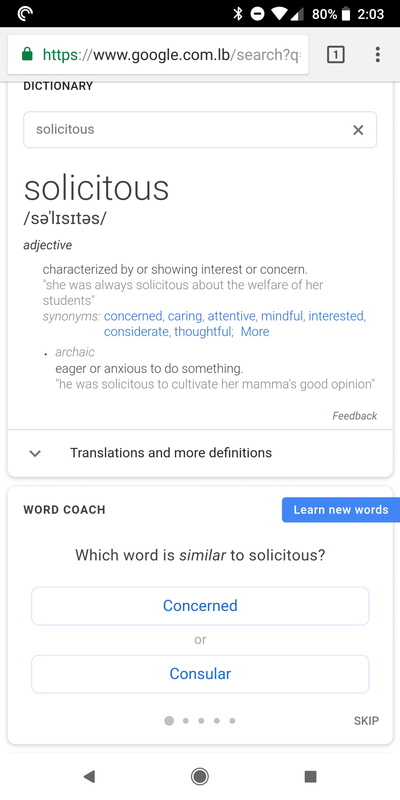 I did so a few times until I started getting words like solicitous, which are at the very limit of my expanding English-as-a-third-language vocabulary. SAT flashbacks guaranteed. 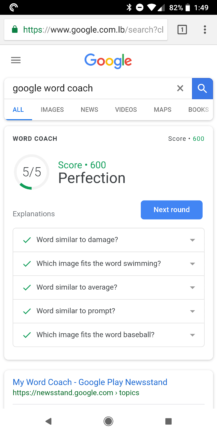 The main downside now to this educational game/test is that it doesn't seem to remember your score. If you close your search and try it again, you go back to 0 and have to level up from the start. 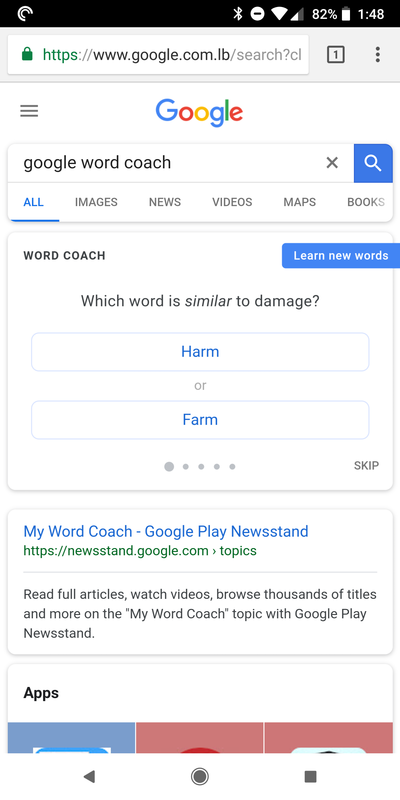 Word Coach now has its own homescreen icon. 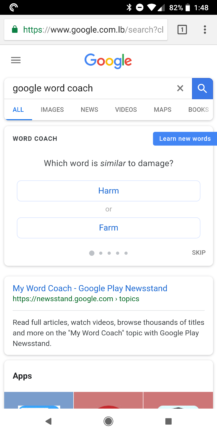 Look for the icon with a phone and arrow at the bottom left of your Word Coach card. Once you tap it, you'll get a nice icon you can place anywhere on your homescreen. Thanks, Muneer!